"Pan-roasting in duck fat gives these potatoes a luxurious flavor that can't be added any other way. These potatoes will step up your breakfast game and have everyone beg you to make them again and again! This also makes a wonderful breakfast dish; just serve alongside some eggs and bacon and you are all set!" Melt duck fat in a large skillet over medium-high heat until shimmering, about 1 minute. Add potatoes; cook, stirring minimally, until potatoes are golden brown, 5 to 10 minutes. Drain excess fat. 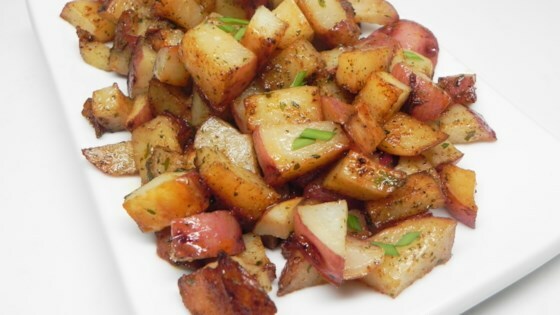 Combine parsley, salt, and white pepper in a bowl; toss over cooked potatoes to coat evenly. If you are a fan of white pepper, you can increase the amount to 1/2 teaspoon, which is the amount we use when we cook this dish. I dropped it down for the sake of this recipe since not everyone is as big of a fan as we are of the ingredient. Feel free to use bacon fat instead of duck fat; you can also substitute olive oil for duck fat to make this dish vegetarian. This was amazing! The duck fat gives the potatoes such a rich and deep flavor. I did end up adding more herbs but it is great as written too. 5 stars all the way! Delicious and the way to go when the oven is occupied with a prime rib. These were not my favorite but my kids loved them. Next time I would add some onions or more herbs. The duck fat was a little hard to find. Ended finding it a fresh market or Whole Foods.